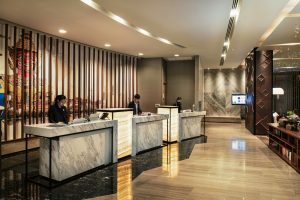 Novotel Bangkok Sukhumvit 20 is your next choice for a new hotels in Bangkok, offering a gateway the exotic cultural charms of Bangkok the capital of Thailand. Within minutes you can board the city’s Sky Train at BTS Asoke or the cities underground MRT Sukhumvit station, also provided by the hotel is a complimentary tuk tuk service to nearby areas. The hotels convenient location will provide you with easy access to decadent shopping malls, local markets, fine restaurants, nightlife and cultural attractions such as the Grand Palace and Wat Pho. You are truly in the center of everything that Bangkok and Sukhumvit has to offer. After a long day of exploring the city or conducting business in the CBD, you can relax in style at our infinity pool or rooftop bar ‘Sky On 20’. Our Food Exchange Restaurant and Gourmet Bar offer a wide variety of Thai, western and international cuisines and drinks. When dusk nears, what better way is there to celebrate the evening than lounging poolside on the 9th floor or taking in a breathtaking sunset from our rooftop bar ‘Sky on 20’ on the 26th floor? If you would rather relax in your own private space, our comfortable, classy rooms provide a stylish place to unwind. With Novotel Bangkok Sukhumvit 20’s restaurants, bars, comfortable rooms and central location, guests truly have it all at Novotel. 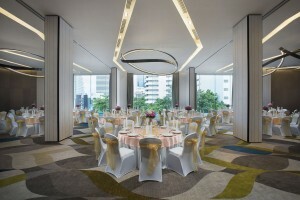 Also provided are an extensive range of state of the art meeting facilities to make our Novotel an ideal choice of venue for corporate, business activities and events. The best Novotel we've ever been! Great staff, amazing rooms and excellent service! For Stay from 10 April – 31 October 2019 Not a member yet? Free Sign up!